As Eli Mintz of VIXCentral predicted, Barclays is going to change the tickers for VXXB and VXZB back to VXX and VXZ. This will occur effective 2-May-2019. As I note below in post, Barclays has done this sort of thing before to preserve the branding of a popular product. I doubt the ticker changes will fix one thing that Barclays lost with the VXX-VXXB and VXZ-VXZB transitions, the ability to incorporate these products in the OCC’s Portfolio Margin Program. This opens up an opportunity for VelocityShares’ VIIX and Proshares VIXY to gain market share at VXXB/VXX’s expense. VXX finished out its 10-year life with a closing value of $38.28 and $449 million in assets. Barclays’ replacement product, VXXB, has revved up nicely with rising volumes and assets (it’s at over $700 million now). Any VXX shares of record at end of day, January 29th, were converted to cash on the 30th. There was some speculation that the closeout of hedges associated with VXX’s assets would trigger some disruption in the volatility markets, but even though $449 million is a lot of money it’s still small change in the overall scheme of things—particularly when it is a planned exit. Nothing of note happened. It was surprising that VXX’s assets remained high until the end. Approximately 50% of the shares being held in VXX the week before the maturity date were allowed to go to cash instead of rolling into an equivalent investment like VXXB. Was it because a lot of the people are unaware of the upcoming close-out? In the last few days, there was very little growth in VXXB, which implies to me that there wasn’t a lot of institutional shuffling at the end. Why did VXX Going Away?? On January 30th, 2019 VXX was delisted and it no longer trades. It’s highly unusual, if not unprecedented for a product normally in the daily volume top 10 lists to go away. This post will discuss why VXX disappeared, how Barclays, VXX’s issuer, handled the transition, and the impact on shareholders, options traders, and short sellers. VXX was an Exchange Traded Product (ETP) that’s internally structured as a bond. It was not a “normal” bond but it did share some bond like characteristics—including a maturity date. When Barclays introduced VXX in 2009, it was the first volatility based ETP and it was very unclear what the market reception would be. 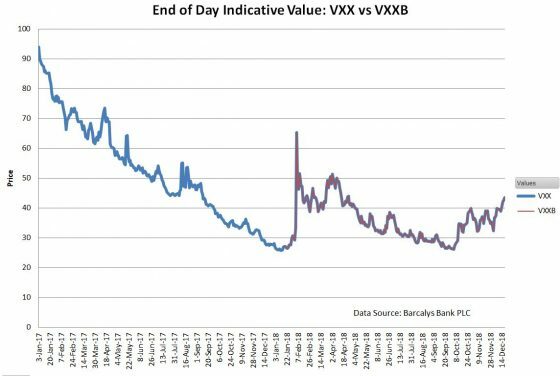 I suspect Barclays viewed VXX as an experiment that might not pay off, so they set its maturity date at a relatively short 10 years. Even though VXX turned out to be very successful, there’s no getting around a non-extendable maturity date, Barclays had to let VXX mature and cease to exist. For most of its existence, VXX’s assets ranged between $800 million and $1.2 billion—making it a good money maker for Barclays. Unwilling to let this money making machine die, Barclays created a “Series B” version, this time with 30 years until maturity. Barclays introduced VXXB over a year before VXX’s end date, on January 17th, 2018, allowing plenty of time for shareholders to transition. As you can see in the chart below the values of the two funds tracked very well, in fact, they match down to the last decimal point. The VXXB’s issuer call provision is equivalent to provisions in competitive products, VelocityShares’ VIIX and ProShares’ VIXY. VelocityShares has “Accelerated Redemption” and ProShares has “Termination Events.” These provisions allow the product issuers to shut down their funds if they wish, without cause, and pay the shareholder the share’s value at that point in cash. As long as VXXB is economically viable it’s unlikely that Barclays will shut it down. Bottom line, VXXB is effectively the same as VXX except for the January 23rd, 2048 maturity date. In the past, Barclays has encountered similar situations where old ETNs matured and they have replaced them with “B series” replacements. In many of those cases, they have waited a bit and then changed the ticker back to the original one. In the case of GAZB for example, the inception of the new fund/ticker was in March 2017 and they changed it back to GAZ in November 2018. If this pattern holds true we might see Barclay rename VXXB and VXZB back to VXX and VXZ before the end of 2019. Speaking of competitors, the two I mentioned have distinguishing features. 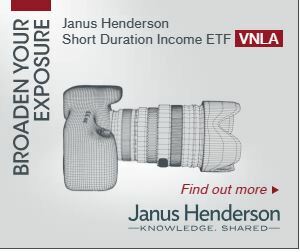 VelocityShares’ VIIX has a 21% lower annual fee, 0.70% per year, 15% lower than VXXB’s 0.89%. ProShares’ VIXY annual fee is 0.87%, almost the same as VXXB but it’s structured as an Exchange Traded Fund (ETF) compared to the Exchange Traded Note construction of VXXB and VIIX. In theory, the ETF structure has lower counter-party risk, but in the case of these VIX futures-based products, it makes VIXY subject to K-1 tax reporting. K-1 reporting adds some tax return complexity (and the K-1 forms are always late) but sometimes will reduce your effective tax rate. Even through VXXB has been trading for over a year its volumes were meager at first. For example, see this mid-day screenshot from May 14th, 2018. Some people incorrectly inferred that low trading volumes in VXXB’s indicate inferior liquidity. With the stock of a corporation there’s some merit to this assumption, but with ETPs, the story is completely different. Liquidity refers to how much the price of a security changes in the face of out of balance buying or selling. With company stocks, liquidity is dependent on how many shares are publically available for trading and how inclined the stockholders are to buy or sell at a given price. ETP liquidity is fundamentally not dependent on the supply/demand dynamics of the fund itself, but rather on the underlying securities that the fund tracks. In VXXB’s case, the underlying is short term VIX futures, the same underlying as VXX—and short term VIX futures are very liquid. This post goes into detail on the liquidity of ETPs, but the key point is that Authorized Participants (APs), institutional players in the market maintain liquidity and earn a profit by keeping the price of ETPs close to their tracking prices, the price set by the underlying securities. Unless conditions are extreme, the APs do a very good job of selling shares in the face of buying pressure, and buying shares if sellers predominate when the underlying securities are liquid. While VXXB’s liquidity is very good, there’s still an opportunity to be stupid. Don’t just put in a market order to buy or sell, use a limit order so that you control the price of your transaction. It’s no mystery why VXXB’s trading volumes were low—there was no need. When VXX went away VXXB effortlessly took up the liquidity load. VXX/VXXB options were an area impacted by the transition. 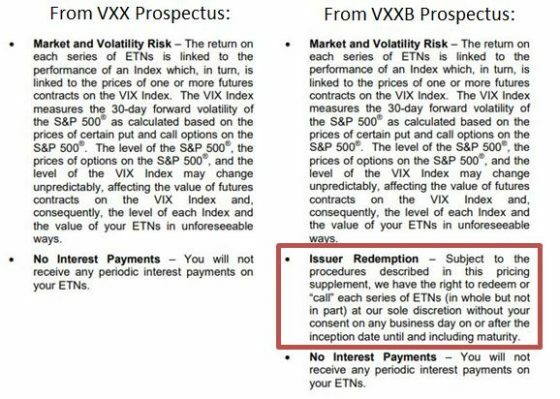 Because VXX was going away the end of January 2019, it couldn’t have listed options with expirations beyond that. VXXB has option expirations listed out to at least January 2021 but in December 2018 volumes were light and bid/ask spreads are wide. For example, in December 2018 the bid on March $70 strike calls was $4.70 and the ask price, $9.00—a huge gap. However, experienced option traders know that selling options at bid or buying them at ask is a sucker’s move, equivalent to selling a used car at the first offered price or buying a new car at list price at a sleazy car dealership. Using limit orders within a few cents of the mid-price, halfway between the bid and ask price, will almost always get filled. As of January 28th, the spreads on these options tightened up into normal ranges. If you did nothing you were automatically cashed out using the Indicative Value (IV) closing price on January 29th$38.28. Before the maturity date, If you had 25000 shares or more, Barclays made special provisions available, but if you weren’t in that league then brokers were offering exchange programs. Fidelity, for example, would swap your VXX shares for VXXB shares with no Fidelity commission. Barclays facilitated this. Otherwise, you could have waited for a fairly quiet day on the market and put in a sell limit order at the bid price for VXX while having a buy limit order for VXXB at the mid-price plus one cent ready to go as soon as your sell order fills. This transaction would likely cost you two or three cents per share. If you were short VXX and did nothing your position was called back by the owners before the 29th of January. I don’t know what the current borrow rate is, or even which brokers are supporting VXXB short sales, so some phone calls would be in order. On the subject of VXXB shorting, one commenter mentioned that he’d heard that the Option Clearing Corporation’s (OCC) Portfolio Margin program would not be accepting VXXB. According to him, the OCC had received regulator guidance in 2014 that new Exchange Traded Notes (as opposed to Exchange Traded Funds) should not be added to the program. I don’t know how important/broadly used the OCC’s program is. It supports margin calculations that include other positions in your portfolio to make a more sophisticated determination of how much margin you need to maintain. For example, if you’re short VXXB but are also holding some out of the money VXXB calls, those calls reduce the risk of your position and could reduce your cash margin requirements. I tried the OCC’s portfolio margin calculator. It accepted VIIX, and VIXY, but not VXXB. Until now I haven’t mentioned VXX’s sister product, VXZ. Instead of being tied to short term VIX futures, VXZ’s price was set by a rolling mix of 4th, 5th, 6th, and 7th-month VIX futures. VXZ is a much mellow performer than VXX on both the up and downsides and has never has been as popular (In December 2018 it had $45 million in assets). VXZ also matured on the 30th of January with VXZB standing by to take over. As was the case with VXX, a surprisingly large chunk of VXZ’s shares were allowed to go into cash ($43 million) instead of being transferred to VXZB. Yearly percentage gains/losses (years before 2009 are from my VXX simulation). 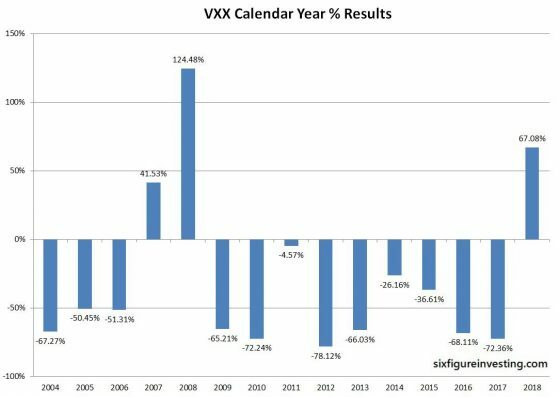 In an interview with Saqub Ahmed from Reuters, I mentioned that in my simulated plus historical results, 2007 and 2008 were the only years in addition to 2018 where VXX had a calendar year gain. For more on that see the Reuters article. The closeout of VXX went very quietly. In an interview with Luke Kawa from Bloomberg, I explained why that was the predictable outcome. For more on that see the Bloomberg article. Five reverse splits since inception, an average of one every 20 months. If you had bought 1024 shares at inception you’d now hold one share. VXX has handed the baton to VXXB. We can expect VXXB to continue VXX’s tradition of brutal losses punctuated with a few dramatic victories. Long term, we can expect VXXB to continue its predecessor’s march to zero.